Cast: Gary Cooper ( Will Kane ); Thomas Mitchell ( Jonas Henderson ); Lloyd Bridges ( Harvey Pell ); Katy Jurado ( Helen Ramirez ); Grace Kelly ( Amy Kane ); Otto Kruger ( Percy Mettrick ); Ian MacDonald ( Frank Miller ); Lon Chaney ( Martin Howe ); Harry Morgan ( Sam Fuller ); Eve McVeagh ( Mildred Fuller ); Harry Shannon ( Cooper ); Lee Van Cleef ( Jack Colby ); Bob Wilke ( James Pierce ); Sheb Wooley ( Ben Miller ); Tom London ( Sam ); Ted Stanhope ( Station master ); Larry Blake ( Gillis ); William Phillips ( Barber ); Jeanne Blackford ( Mrs. Henderson ); James Millican ( Baker ); Jack Elam ( Charlie ). Foreman, Carl, High Noon , in Three Major Screenplays , edited by Malvin Ward and Michael Werner, New York, 1973. Griffith, Richard, Fred Zinnemann , New York, 1958. Fenin, George N., The Western: From Silents to Cinerama , New York, 1962. Gehman, Richard, The Tall American: The Story of Gary Cooper , New York, 1963. Dickens, Homer, The Films of Gary Cooper , New York, 1970. Jordan, Rene, Gary Cooper , New York, 1974. Nachbar, Jack, editor, Focus on the Western , Englewood Cliffs, New Jersey, 1974. Parish, James Robert, and Michael Pitts, editors, The Great Western Pictures , Metuchen, New Jersey, 1976. French, Philip, Westerns , New York, 1977. Arle, Hecton, Gary Cooper: An Intimate Biography , New York, 1979. Kaminsky, Stuart M., Coop: The Life and Legend of Gary Cooper , New York, 1980. Swindell, Larry, The Last Hero: A Biography of Gary Cooper , New York, 1980. Chardair, N., Gary Cooper , Paris, 1981. Rausa, Giuseppe, Fred Zinnemann , Florence, 1985. Goldau, Antje, and others, Zinnemann , Munich, 1986. Buscombe, Ed, BFI Companion to the Western , London, 1988. Zinnemann, Fred, My Life in the Movies , New York, 1992. Drummond, Phillip, High Noon , London, 1997. Meyers, Jeffrey, Gary Cooper: An American Hero , New York, 1998. Nolletti, Arthur, Jr., The Films of Fred Zinnemann , Albany, 1999. Burton, Howard, " High Noon : Everyman Rides Again," in Quarterly of Film, Radio, and Television (Berkeley), Fall 1953. Giannetti, Louis, "Fred Zinnemann's High Noon ," in Film Criticism (Meadville, Pennsylvania), Winter 1976–77. Bodeen, DeWitt, in Magill's Survey of Cinema 2 , Englewood Cliffs, New Jersey, 1980. Palmer, R. B., "A Masculinist Reading of Two Western Films, High Noon and Rio Grande ," in Journal of Popular Film and Television (Washington, D.C.), Winter 1984–85. Rapf, J. E., "Myth, Ideology, and Feminism in High Noon ," in Journal of Popular Culture (Bowling Green, Ohio), no. 4, 1990. Comuzio, E., "Tempo reale e tempo iconico allo scoccare del Messogiornio di fuoco ," in Cineforum (Bergamo, Italy), January-February 1992. Foster, Gwendolyn Audrey, "The Women in High Noon : a Metanarrative of Difference," in Film Criticism (Meadville), vol. 18–19, no. 3–1, Spring 1994. Prince, Stephen, "Historical Perspectives and the Realist Aesthetic in High Noon ," in Film Criticism (Meadville), vol. 18–19, no. 3–1, Spring 1994. Caparros-Lera, J.M., "Cinematic Contextual History of High Noon ," in Film-Historia (Barcelona), vol. 6, no. 1, 1996. Orme, A., "The Impossibility of Inscribing Meaning: Interdeterminacy and the Interpretive Act in High Noon and John Cunningham's The Tin Star ," in Michigan Academician , vol. 29, no. 3, 1997. 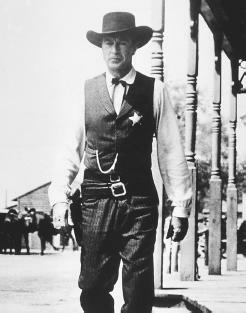 Lefebvre, J., "High Noon : le western devient majeur," in Cinemaction (Conde-sur-Noireau), no. 86, 1998. In an interview, Fred Zinnemann gave his recollections of Cooper and High Noon : "His recurring hip problem bothered him on one or two occasions. It made it difficult for him to do the fight with Lloyd Bridges, but it didn't stop him from working very hard and very long hours under some trying conditions. If I remember correctly, we made the entire film in 31 shooting days. Not once were we delayed or held up by him for whatever reason. For most of the time he had seemed in good health, and it was only two or three months after shooting had been completed that he became ill.
For his performance in High Noon , Cooper won his second Academy Award. Yet it is a performance in which he does less with the character than he had done with almost any of his major roles before. His walk is stiff and pained. His arms remain at his sides through most of the film. He hasn't a single extended speech. What audiences apparently responded to was the look that Zinnemann had captured and that Cooper, with years of experience, had played on. They also responded to the simple story of a man who is not supported by his community in a time of mortal crisis and who triumphs alone through courage and determination.